A perspective on life and work, with a little lift. Posted on December 12, 2014 by Who Said That? Living in a resort town, you would think that we get the Christmas bug early. Vail’s lights are up well before Thanksgiving (maybe they never take them down, now that I think about it) and Santa comes to Beaver Creek the Friday after Turkey Day to help kick off the season. He and a few of his elves have even been known to parachute into Copper Mountain’s village at night, complete with twinkling beacons so we can see them in the frozen sky. And yet, every year since we have lived here, Christmas has a way of sneaking up on me. What is it about this place? Maybe because it gets dark really early, so in the evenings I just want to curl up on the couch rather than make Christmas cookies. Today, as my cart bumped past couples and families stocking up for their ski vacations at the grocery store, it hit me. Christmas is fast approaching and I’d better get my jingle bell groove on. As we get closer to December 25, we who live here begin to drive a little more defensively, particularly in those pesky round-a-bouts which befuddle our visitors. Generally, drivers who are new to this grand invention of traffic control either careen around them as fast as possible while their passengers assume the head covered tornado drill position (“Hang On!”); or they slowly creep around it a few times, hazard lights flashing, while other cars dodge in front and behind. We also find ourselves looking the other direction as we back out of our parking spaces because the vacationers can’t seem to get the fact that it is a one-way lot. They cluelessly drive past, going the wrong way in their rented Suburban, Starbucks in one hand and iPhone in the other. But we love having them here, even if we do have to adjust our shopping schedules and our expectations for the availability of parking spaces. They bring the holiday spirit with them. They remind us that we get to live in a place where other people would rather be. They have counted down the months, weeks, days, hours and minutes until they could breathe our thin air. So, as we duck our heads to avoid the skis swinging past us in the Village, let us all be grateful for the reminder that the holidays are upon us and we are pretty fortunate to get to spend them in such a fabulous place. (And don’t forget to pick up some eggs and bread before the shelves are bare.) Cheers! 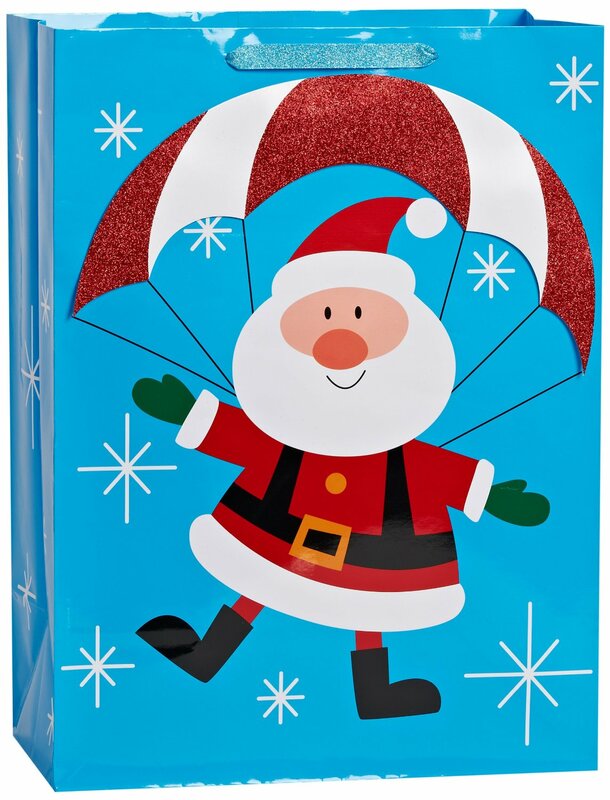 Photo from Amazon.com, American Greetings Christmas Jumbo Holiday Gift Bag, Santa Parachuting. Yes, this can be yours for just $11.09 with Amazon One-Click(R). Act now! This entry was posted in Life, Tilting Toward Balance and tagged Christmas, Colorado, Humor, Skiing, Tourist Season, Tourists, Vacation, Vail by Who Said That?. Bookmark the permalink.